Dynamite Delivers The Boys Omnibus Publishing Schedule! November 21, Mt. 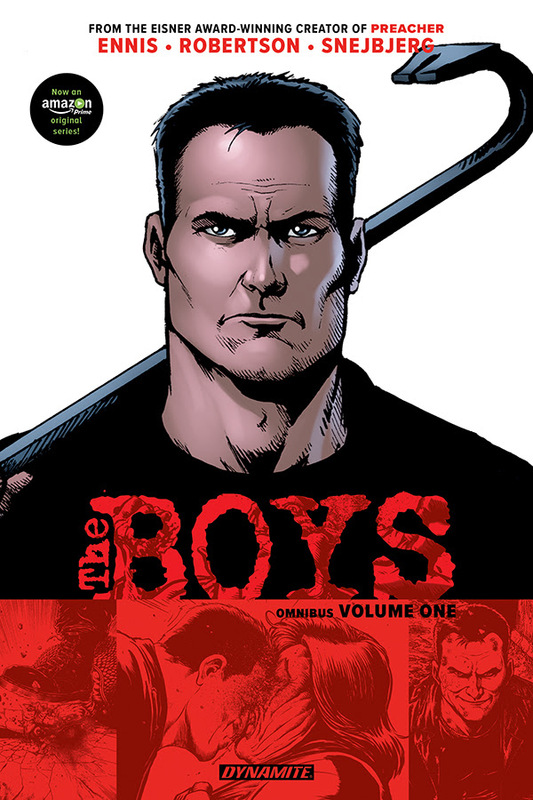 Laurel, NJ: Dynamite Entertainment is releasing Garth Ennis and Darick Robertson’s Eisner-nominated series, The Boys, in a brand new format for fans and readers looking to jump on board with the critically-acclaimed series before the television adaptation debuts with Amazon Prime Video in 2019. At a massive 344 pages, the fan-favorite series draped in controversy is now presented in an omnibus edition as Dynamite releases the first 14 issues of the acclaimed series in one oversized trade collection! Join the most brutal government operatives ever assembled in tales of mayhem and dark humor, as chronicled by Garth Ennis, Dennis Robertson, and Peter Snejbjerg. Meticulously restored, The Boys Omnibus Edition Volume 1 also features bonus art materials, the script to issue #1 by Garth Ennis, a co mplete cover gallery with iconic artwork by Darick Robertson, and much more. Some superheroes have to be watched. Some have to be controlled. And some of them — sometimes — need to be taken out of the picture. That’s when you call in The Boys! In a world where costumed heroes soar through the sky and masked vigilantes prowl the night, someone’s got to make sure the “supes” don’t get out of line. Billy Butcher, Wee Hughie, Mother’s Milk, The Frenchman, and The Female are The Boys: A CIA-backed team of very dangerous people, each one dedicated to the struggle against the most dangerous force on Earth – superpower! The Boys Omnibus Volume 1 will be released in stores everywhere March 2019. The Boys Omnibus Volume 2 and The Boys Omnibus Volume 3 are expected to see May and July release dates, respectively. The Boys Omnibus Volume 1 will be solicited in Diamond Comic Distributors’ December 2018 Previews catalog, the premier source of merchandise for the comic book specialty market, and slated for release in February 2019. Comic book fans are encouraged to reserve a copy of The Boys Omnibus Volume 1 with their local comic book shop or pre-order through Amazon, Barnes & Noble, or retailer of their choosing.